Another Day, Another State! Yes, I have been clocking up the mileage when it comes to discovering another new American state. Virginia was no exception, a definite surprise if nothing else. 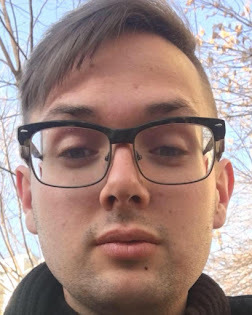 Whilst away taking some time out in Washington, D.C I looked at my tourist map to naively discover that another brand new state lay undiscovered just over the Potamac River. So here's to visiting and loving my tenth American state! 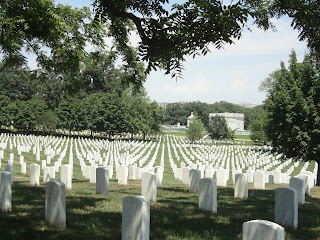 At first I did not have a clue that another state was so close to where I was staying in Washington, D.C. Without further ado I checked out of my Marriott hotel and took the first Metro bound for the Pentagon. 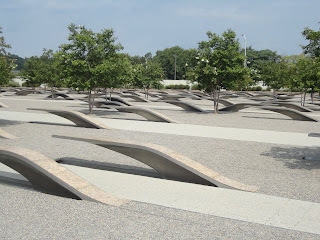 I know I have a habit of visiting unusual places, but the Pentagon and the Pentagon Memorial Site were well worth the visit. I wanted to take the chance to visit such a landmark that has experienced such terrible sites from the tragedies that took place on September 11th, 2001. It's forbidden for any photos to be taken in and around the Pentagon so it was really difficult for me to abide by this rule, how can I be the intrepid blog explorer if I can't capture the location!? Never-the-less it was a very sobering experience to see another location that was blighted by the attacks around September 11th. On a positive note it was nice to see that the memorial site was a peaceful place that remembered the victims with dignity and respect. You ask why I called this blog 'Golden Virginia?' For one reason my day in Virginia was golden and also 'Golden Virginia' was one of my Great-Grandad Tom's preferred choices of tobacco. I'm sure if Tommy A read about this reference to the blog title he would find it amusing, yes I'm very sure. So I guess this blog is dedicated to my late Great-Grandad Tom! 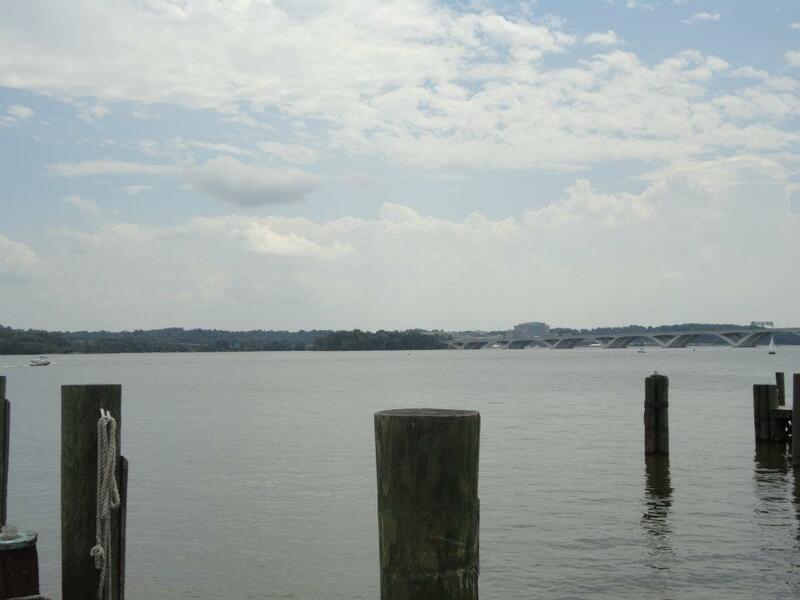 Taking a step back in time by visiting the waterfront of Alexandria. I totally trusted the Metro system to take me to another interesting place as I simply had no idea of what sights I would be seeing that day. 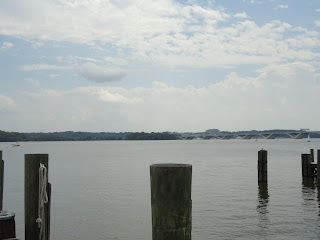 After walking down King St. for a little while I discovered the banks of the 'Potomac River.' In actual fact I was facing three states, standing in Virginia and overlooking the borders of Maryland and District of Columbia. I loved the small town feeling of King St. that set Alexandria apart from the large scale and sterile feel of the Pentagon, considering that it was only a few stops away from this lovely sight. The weather was a complete scorcher by the time I was a the waterfront, it would soon be time for a refreshment break before pushing ahead further. Taking enough time to admire the small-town charm that this lovely place had to offer before making my way to the next phase of my Virginia discovery day. I even saw an ice cream parlor that was called 'Pop's' that pleased me because I call my paternal grandfather Pops! I do now wish I had waited a little bit longer to take this trip as the Nandos restaurant on King St. had not opened yet, but how was I to know such a thing before I decided to even visit this town?! So far, so very very good. I don't think my Virginia experience was over just yet, so let's push on because soon enough Newark would be calling me back to work! As my Virginia adventure unfolded just that little bit further I was hungry for more to see and to do, being ever mindful of the time was something that needed to be considered. My Bolt Bus back to Newark Penn Station would be leaving that evening from Union Station at 6:15pm. I think its time for a change of scenery then I suppose. Zipping back towards District of Columbia but still staying in Arlington County, VA I decided to take it easy by taking a stroll around the Arlington National Cemetery. It was a first for me as I've never gone out of my way visit a graveyard. I guess that a visit to this side of town would be on the cards from the moment I saw the sign for Arlington County the previous day as I was making my way to Georgetown, I just knew I was meant to be seeing something special this side of the Potomac River. One thing I did see was the gravestone of John F Kennedy, talk about a random celebrity discovery. I don't think I'll be making a habit of visiting cemeteries in the future as its not the most happiest of places to encounter whilst on holiday or even in general terms. I suppose in some kind of way the feeling of the cemetery cleared my head and left me with a feeling of calm and serenity. Virginia You Are So Golden! My Golden Virginia!